What Is a "Super Food"? Have you ever heard the term "super food" and wondered what that was? What makes a certain food "super"? Super foods contain multiple disease-fighting nutrients and fill you up so you can enjoy plenty of food without excess calories. You will find lists all over the Internet of the "Top Super Foods," but keep in mind that these lists by no means include all of the nutrition foods that should be part of a healthy diet. 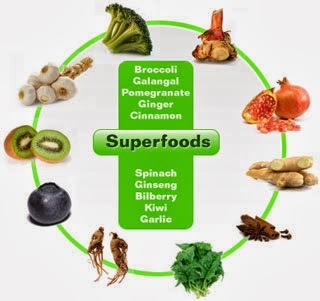 The best super foods provide several different nutritional needs. Try to work some of these items into your everyday diet for the most benefit. 1. EGGS! Eggs are nutritious and can be used in many different ways. They are also economical and full of protein. Elizabeth Ward, MS, MD, and author of The Pocket Idiot's Guide to the New Food Pyramids, says that "Studies show if you eat eggs at breakfast, you may eat fewer calories during the day and lose weight without significantly affecting cholesterol levels." Eggs also contain 12 vitamins and minerals, including choline which is good for the brain. 3. BERRIES! Berries pack a lot of nutritional goodness in a small package. Berries are loaded with good-for-you antioxidants and phytonutrients, while being low in calories and high in water and fiber content. Berries can help control blood sugar levels and the fiber can help keep you full longer. Blueberries are the best berry because they have the highest levels of antioxidants and can be found almost anywhere. 4. SALMON! Salmon is packed full of omega-3 fatty acids. Study after study has shown that omega-3 fatty acids help protect heart health. The American Heart Association recommends eating fish like salmon two times per week. Salmon is low in calories and high in protein, a good source of iron and is low in saturated-fat. If salmon isn't your thing, you can substitute with tuna, or another kind of fish. 5. BROCCOLI! Broccoli has been linked to lower levels of breast cancer risk by fighting excess estrogen. This super food is high in Vitamin C and a great source of Vitamin A. Broccoli also helps you feel full on less than 30 calories per service and is full of fiber, folate, calcium, iron and potassium. Broccoli can be enjoyed cooked or raw, making it easy to add to your nutrition plan. 6. GREEK YOGURT! Greek yogurt is very thick and creamy, with a tangy taste. It is full of calcium and great for our bones. The fat-free variety of Greek Yogurt has twice and much protein as regular yogurt. Greek yogurt is also full of probiotics, which are cultures that can help ease Irritable Bowel Syndrome. Plain Greek Yogurt can also be a great substitute in recipes and replace items such as fatty sour cream and oil. Now as I previously mentioned, this is BY NO MEANS a conclusive list of all the foods you need to have a good nutrition plan. The most important thing to remember for good health is to include all of these foods, along with a wide variety of other nutritious foods and regular exercise.